Constantly stewing over a problem can lead to excessive release of cortisol in the brain which can cause short-term memory loss or mental disability, says a study. Cortisol, also referred to as ‘stress hormone’ is a steroid hormone produced by the adrenal gland. It is a hormone released in response to stress. Cortisol at optimal levels is needed for survival, but an abnormal release of the hormone can lead to memory impairment and mental health problems. A new study by the University of Iowa researchers has associated high levels of cortisol with slow and steady synapses loss in the prefrontal cortex, the brain region responsible for short-term memory. Synapses are the connections between neurons that help us in processing, storage and recall of information. Prolonged and constant exposure to cortisol causes shrinkage and eventual disappearance of these synapses. “Stress hormones are one mechanism that we believe leads to weathering of the brain,” according to Jason Radley, assistant professor in psychology. Besides, chronic stress also stimulates chemical imbalance in the brain which makes it more prone to mental ailments, such as short-term memory loss and dementia. White matter structure defects can also cause depression, bipolar disorder, schizophrenia, obsessive-compulsive disorder and post-traumatic stress disorder. Neuroscientists have also identified a link between anxiety and brain defects. While low anxiety levels can affect memory recalling capacity of the brain, high anxiety levels can lead to white matter development that can in turn result in brain defects. A study published by the National Institutes of Health called “White Matter in Learning, Cognition and Psychiatric Disorders” features the brain’s production of white matter and how it influences the development of a variety of disorders. According to Rachel Anderson, the research lead, and Radley, short-term memory disabilities linked to cortisol start arising around age 65. However, researchers reminded that cortisol is only one of the many factors responsible for memory loss and mental decline as we grow old. Brain degeneration is also linked to sleep deprivation in older adults and drinking in excess of two and a half drinks per day can cause more memory loss and cognitive impairment than in people who drink within limits or who don’t drink at all. Although, the study is only preparatory, the findings have laid the groundwork for treating short-term memory loss by decreasing levels of cortisol. This entry was posted in Health News and tagged health news, Memory Loss, release of cortisol, short-term memory loss. 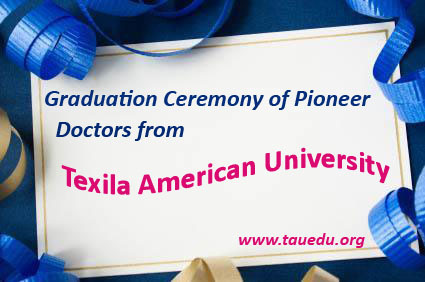 Texila American University graduated its pioneer batch of doctors on 7th June 2014. 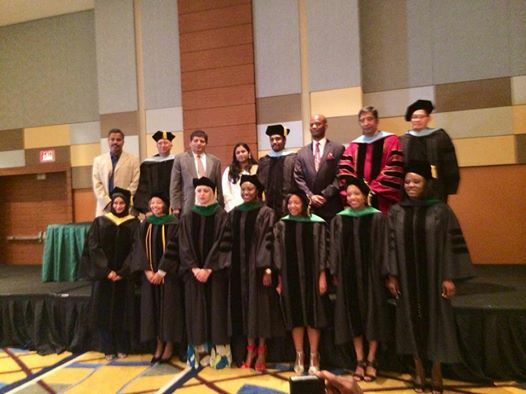 The graduation ceremony was held at Marriott Marquis, located in 265 Peachtree Center Ave NE, Atlanta, GA 30303. It was a historical moment for everyone involved for the years of hard work in developing a University with the quality of education it provides today! The University commenced its humble beginning in 2010 only with the On-campus programs in Medicine. Further it expanded its program views across On Campus programs for nursing as well. Further it collaborated with decade’s old Partner Universities to provide Academic support to Distance and Online Programs. Currently, TAU holds the students from 35 different countries. Today, Texila American University is a thriving Medical School rendering education to the students from different nationalities. Since its inception, Texila American University has been in the forefront rendering education with high professionalism and exactness. The graduates were admitted to the University for the four year Doctor of Medicine courses. Added to this, the First Graduate has matched into the residency (Post Graduate) program in the United States. The Oath taking Ceremony was the highlight of the occasion, with the participants promising to lead their life accordingly. The Chief Executive Officer of the University commenced the graduation speech on behalf of the institution. Further, The Dean, Vice-Chancellor and other Board members also conveyed their influencing messages to the graduates. The function was concluded with the National Anthem. This entry was posted in Educational News and tagged best caribbean medical schools, caribbean medical universities, list of caribbean medical schools, medical schools in the caribbean, top caribbean medical schools. 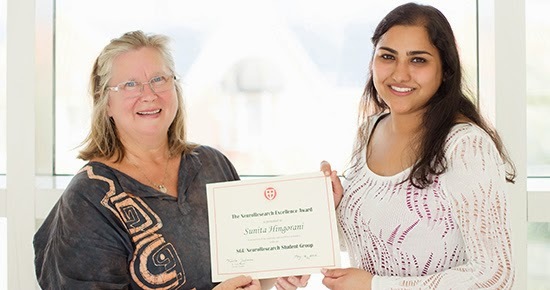 St. George’s University fifth-term medical student Sunita Hingorani was recognized for her contribution to the founding and growth of the NeuroResearch Student Group, a contingent of SGU students dedicated to research in neuroscience. Thus, when it came time for Dr. Tuula Jalonen, Professor of Neuroscience at SGU, to award the inaugural NeuroResearch Excellence Award, Ms. Hungrani was an easy choice. NeuroResearch has grown from a membership of five in 2012 to more than 30 students, all with a thirst and passion for research and neuroscience. Students who join the group devise their own research project or join one of several ongoing projects. The group’s goal is to conduct research significant to neuroscience and with potential benefit for the Grenadian community. Thus far, the group has researched the use of Propofol by physicians, neuropathic pain in sickle cell disease, awareness of Alzheimer’s disease in Grenada, the prevalence and mechanisms of HTLV-1 infection, migraine, depression in schoolchildren, ‘neurophobia’ among medical students, and diabetes and NMDA receptor activity in cells. Through the support of Dr. Marios Loukas, SGU’s Dean of Medical Research, NeuroResearch has acquired a patch clamp for the Department of Physiology and Neuroscience, which will assist them in their research in the upcoming semester. Members of NeuroResearch Student Group have presented at two SGU Research Day events and at the One Health, One Medicine conference. In July, Dr. Jalonen will also present a poster on a mathematical model of HTLV-1 at the Federation of European Neuroscience Forum in Milan. Even though Ms. Hingorani is leaving Grenada for her clinical rotations, her hope is to remain involved in NeuroResearch as much as possible. This entry was posted in Educational News and tagged list of caribbean medical schools, medical schools in the caribbean, St. George’s University, top caribbean medical schools.